One of the trickiest things to pull off in web development is a fully responsive lightbox solution. There are a couple of plugins out there that can help you create galleries with built-in lightbox functionality, but if you’re looking for a standalone solution, WP Lightbox 2 is a great way to go. WP Lightbox 2 adds lightbox functionality automatically to image files that are embedded in your WordPress posts and pages. It uses the Lightbox 2 jQuery plugin behind the scenes to do this for you, then interfaces with WordPress to bring the functionality to your site. The plugin can be switched on so that all posts that link to an image file will display a lightbox, or you can choose to selectively include lightbox functionality in your images through HTML markup. The plugin works for galleries and individual images and includes a function for applying the lightbox to a single piece of content in template files. It also features responsive functionality, so that it will work on smaller screens. After you install and activate the plugin, you will need to go and configure it. To do so, go to Settings -> WP Lightbox 2. At the top, you will see a few options to set. 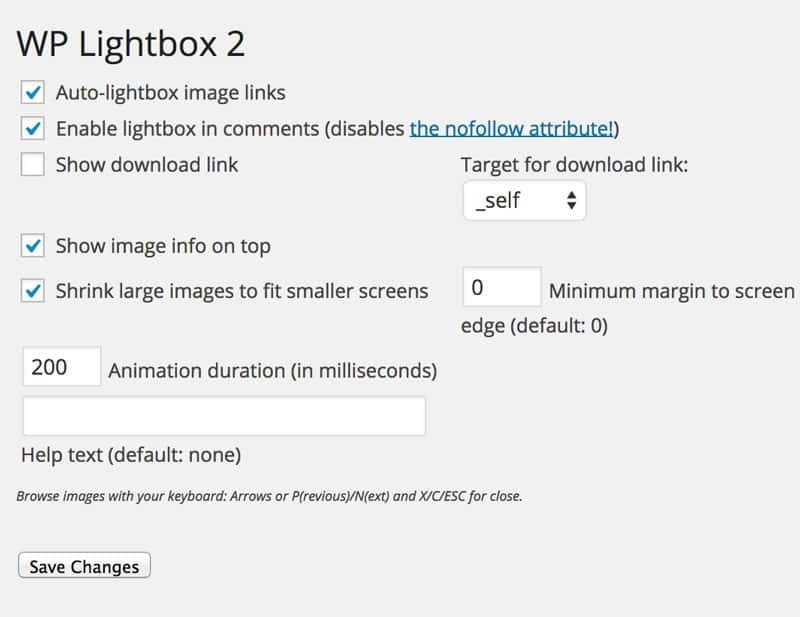 The first option is probably the most important, “Auto-lightbox image links”. 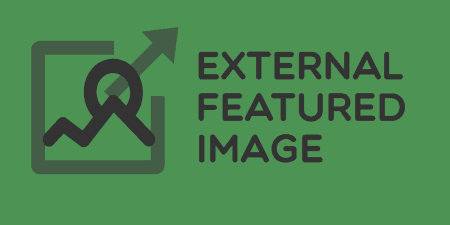 If you check this box, then any image embedded in your post that links to itself will automatically be featured in a lightbox on the front-end. This is the easiest way to use the plugin since everything works without any set-up. The next option is whether or not to “Enable lightbox in comments”. I’d recommend leaving this off, but it is available to you. The next option is “Show download link”. When checked, a link to download your image file will be shown at the bottom of each lightbox, so that users can save your files. 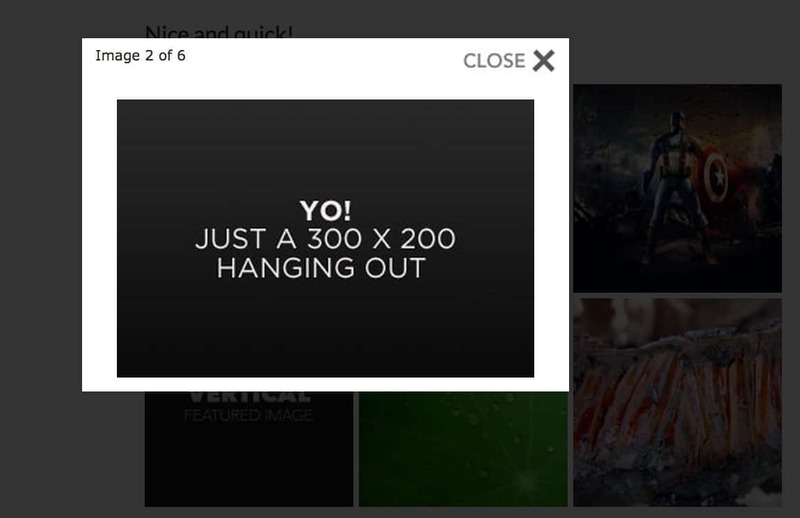 Similarly, the “Show image info on top” will display your caption at the top of the image lightbox if you check it. “ Shrink large images to fit smaller screens” is a very useful option, and I recommend you check it, especially if you are using a responsive theme. This will ensure that the lightbox that displays is no bigger than the size of the user’s device screen. Lastly, you can set the animation duration for the lightbox opening. By default, this is set to 400 milliseconds, but taking it down to 200 milliseconds make the experience feel a little smoother. After you’ve set the plugin up, the lightbox should just start working if you chose to auto-lightbox your images. 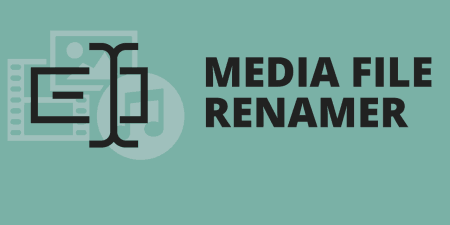 Whenever you add a new image to your page, use the “Add Media” button and the default WordPress media uploader, just like you normally would. Just ensure that the image’s “Link To” option is set to the URL of your image file. From there, WP Lightbox 2 will do it’s magic for you. You can use this in either the text section of your post editor or in theme files. Using “rel=lightbox[roadtrip]” in a series of images one after another will allow users to scroll through the images using left and right arrows in the lightboxes, like a gallery. Replacing $your_content with the full content you want to filter through. The plugin will automatically find the images within these and output a list of images with lightbox functionality enabled. More details about how to use the plugin are included on the Settings page. The easiest way is to simply allow any linked files to automatically include a lightbox so that you have a fully responsive and easy to use lightbox plugin up and running.